Oahu, Hawaii is where you'll experience the heritage of Pearl Harbor, Diamond Head State Monument, world-famous Waikiki and the state capitol and epicenter of Hawaii, Honolulu. Breathtaking Diamond Head, sunset and ocean view home high on a hill in the prestigious Portlock area. Soak in Hanuama Bay, Sandy's and Makapu'u. Visit the Sea Life Park, Blowhole Lookout, two golf courses and the Makapu'u Lighthouse Hiking trail. Just 15 minutes from Waikiki Beach and 30 minutes from the Honolulu International airport, evening entertainment, movie theaters and fine dining is plentiful. Dine on the dock at this oceanfront Kaneohe Bay home. 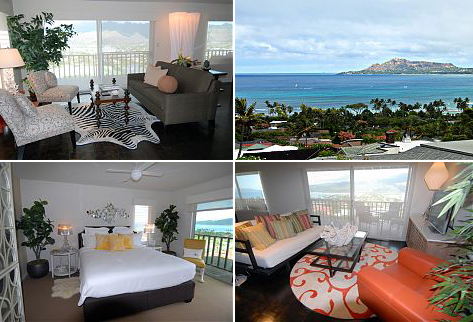 Sunbathe, windsurf and kitesurf on the #1 in the USA rated Kailua beach, just 5 minutes away. With cultural events happening daily and restaurants of every ethnic variety within 15 minutes, you're also just 30 minutes from Honolulu and Waikiki. Enjoy miles of exquisite deserted sandy beach from this country beach house. Just one hour from Honolulu and the airport, this upscale acreage beach lot overlooking the ocean introduces you to Malaekahana Bay, one of Hawaii's best-kept secrets with an abundance of ironwoods, wide sandy beaches and star filled nights. Just 15 minutes from Oahu's famous North Shore surfing beaches, including "Pipeline" and "Waimea Bay", restaurants, horseback riding, the fascinating Polynesian Cultural Center and exotic Waimea Falls Park are right there, too. This beautiful (just renovated) home is located on the quiet, sandy shoreline of Waialua beach, in a small, intimate neighborhood between Puuiki Pt. and Kaiaka Beach Park, with coastline views all the way to Waimea Bay. This open beam cedar home is in sight of, and just a short paddle to, the old "Baywatch' set location at Ali'i Beach. It is also very close to the "Lost" set and to where the movies "Bounce", "Tears of the Sun" and "Blue Crush" were shot. The quiet beach is perfect for swimming, snorkeling, diving, surfing and kayaking, with views of Puiiki, Kaiaka Beach Park, Alii Beach Park, Haleiwa Beach Park, Sunset Beach, Waimea Bay and Tables. Freeway access to Honolulu is just 15 minutes up the hill. Be sure to check out IVHE.com and our Facebook page today, to book and enjoy more vacations like these!